Here at the OpenGov Hub (home of Feedback Labs! ), we constantly think about creating a culture that sparks collaboration. We are a diverse yet like-minded community and shared workspace with 40 organizations and 200 people promoting transparency, accountability and civic participation around the world. We exist to help our members, open governance advocates, share resources and collaborate to be more efficient and effective. This means that collecting and acting on feedback – often, and from diverse members in our community – really matters. It helps us make sure the culture we’re cultivating reflects the shared values, interests and buy-in of its constituents. Here are three lessons we’ve learned about feedback in a collective environment. Get out of inboxes and casually in front of people. 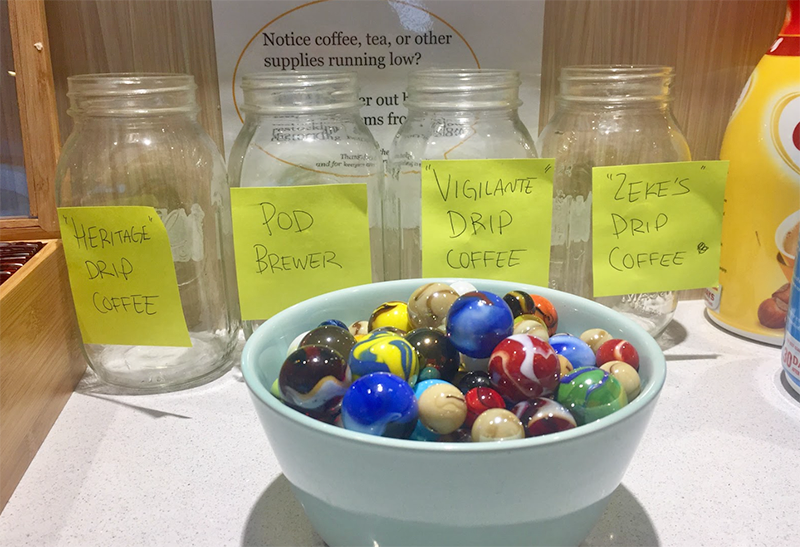 As a physical open Hub, we have the privilege of being an in-person community where serendipitous ‘collisions’ between people often happen at the water cooler/coffee bar. Yet we used to notify members about events and opportunities to collaborate only through email. Then we started to post weekly scrolling announcement slides on TVs in our cafe, the main space people congregate. This small innovation has not only made relaying important information to our members easier; we now also receive more consistent feedback on the wide variety of events and collaborative activities that we organize at least once per week. Where and how you solicit feedback matters, and sometimes the best feedback comes in informal settings. We’ve received some of our most important feedback during more social activities like Ignite Nights, where giving feedback feels natural and easy. This is the result of our efforts to first build relationships across our network, and then create comfortable spaces for members to reflect on and share with us their experiences in the community.We’ve also gotten high participation and great ideas whenever we set up simple, fun voting stations in our space – like flipcharts with workshop ideas that members voted on with colored stickers, and even jars with marbles to vote on a new coffee machine!It’s amazing how strongly people advocated for their beverage preferences. Always keep channels open for anonymous feedback. While informal activities have given us valuable feedback, we complement these with more formal quarterly member surveys. On our last survey, some people were concerned that they couldn’t respond anonymously, so we’ve learned to balance our ability to follow up on feedback with specific people with creating spaces for anonymity. We often want to be able to link feedback back to the people it came from – especially when we ask questions about who is collaborating with whom, in order to capture some of these Hub community impact stories (which relates to the next point). But more than anything, we seek honesty and high response rates, and not giving the option of anonymity prevented us from hearing all voices. Use feedback to identify each stakeholder’s “pain and passion”. People are much more likely to participate in any collaborative effort if they can clearly see what’s in it for them. Many one-on-one conversations started to reveal what our members – , as individuals and organizations – want and need. Knowing this, we can tailor activities that directly meet those needs and interests. Last fall, we were able to collaboratively analyze and aggregate these top-line “pains and passions” of numerous members to identify high-value collaborative activities for the community as a whole. 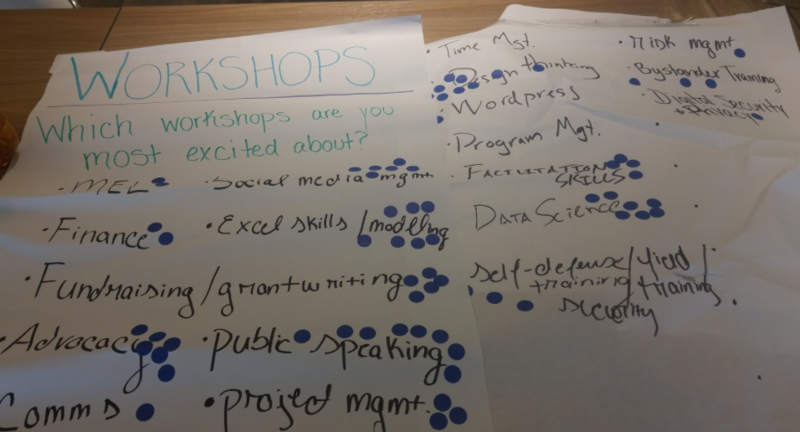 One common pain point across many organizations is the never-ending struggle for funding, so we organized a business development workshop. Our “Communications Guild” was created to help others better tell the stories of the impact of their work and why it matters (you can read more about our collaboration committee and its 2017 toolkit here). 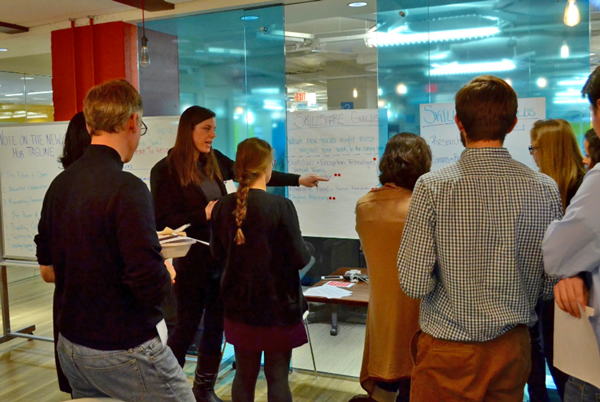 Earlier this year, we hosted a fun 2017 Collaboration Toolkit Kickoff for our members that allowed us to “get in front of people” (by taking over our cafe), collect both anonymous and individualized feedback, and identify specific pains and passions for members. We’re excited to continue learning about how to maximize collaborative culture across a shared space and network of organizations. We’ll continue helping our members share feedback on each other’s work for greater impact, while we collect and act upon feedback ourselves – both on and offline, with and without knowing the identity of the respondent, and in formal and informal settings. Nada Zohdy became Manager of the OpenGov Hub in September 2015. As Hub Manager she oversees all strategy, operations, and programs for this social enterprise, and leads the design and implementation of programs to promote collaboration, innovation and learning across the Hub network. In 2015 she received a Master of Public Policy from the Harvard Kennedy School of Government. Nada worked as a consultant for the OECD through her applied Master’s thesis, which analyzed the opinions of 100 local civil society groups about open government reforms in Tunisia. 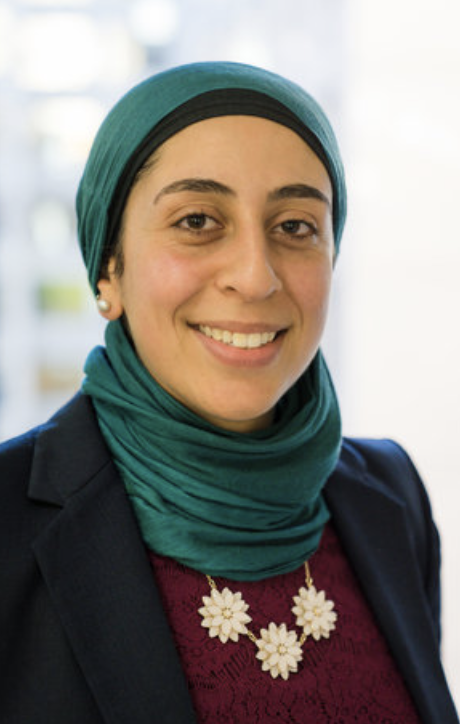 From 2011-2013, Nada was Founding Program Coordinator for Civil Society Partnerships at Washington-based Project on Middle East Democracy (POMED). Over the last decade, Nada has supported 25+ nonprofits in various capacities (half in the U.S., half in the Middle East). These experiences fuel her interest in social impact. She is particularly passionate about civic innovations, locally and globally. In 2009 she received the Truman Scholarship for leadership and public service.